After a nine-year wait and briefly handing the franchise over to Jeremy Renner in 2012 with a box office dud that disappointed fans, Matt Damon returns to the silver screen as the titular rogue CIA-agent, Jason Bourne in the fourth installment of famed author, Robert Ludlum’s popular spy series. As reported by Variety earlier this week, Jason Bourne premiered at the top of the box office and ranked in $60 million on its opening weekend in the U.S., bringing it to a grand total of $109 million worldwide. It might have earned a little less than its predecessors did in its initial weekend and received lukewarm reviews from critics, but the latest is an appreciated sequel to a franchise that unmistakably changed the face of popcorn thrillers as it shies from the lavish James Bond allure. Of course, the two get paired together in a big-screen-secret-agents kind of narrative, but they are nothing alike. While 007 is the type of agent who is funded by his agency, Bourne is a symbol of the resistance and arms himself like MacGyver to seek the truth. With Supremacy and Ultimatum’s returning director Paul Greengrass at the helm of Jason Bourne, the films are best known for their slick combination of edge-of-your-seat thrills with a docudrama grit. While the first three films focused more on the CIA abusing its authority to sanction top-secret black-ops programs within the government to create superhuman assassins, this fourth film is a bit more contemporary in its dialogue. Concentrating on cyber security in the age of social media with Snowden-era intrigue and an evolving realm of budding Julian Assanges, Jason Bourne looks at our modern culture through the technological advancements of Web 2.0. A decade after exposing operation Blackbriar and disappearing into New York’s East River, ex-CIA agent, Jason Bourne (Damon) is forced out of the shadows after former analyst, Nicky Parsons (Julia Stiles) finds information pertaining to Jason’s identity and travels to Greece in hopes of informing him. However, Nicky’s cyber moves are being tracked by intrepid Cyber Ops Division Head, Heather Lee (Alicia Vikander) and the ruthless CIA Director, Robert Dewey (Tommy Lee Jones). Learning that Nicky is meeting with Jason Bourne, an agent the CIA knows all too well, Dewey initiates The Asset (Vincent Cassel) to eliminate the two of them. What follows is an edge-of-your-seat chase of cat and mouse as Jason and Nicky try their hardest to avert The Asset amid a public protest in the streets of Athens. While Jason relives a part of his past in Athens while trying to run, he realizes it’s not over just yet. Intending to find out the answers about his past, Jason becomes entangled in a web of conspiracies worse than Blackbriar and Treadstone as he discovers the CIA is looking to create a surveillance program with the aid of social media giant, Aaron Khalloor (Riz Ahmed) that will allow the government free rein over private information of its U.S. citizens. Realizing that Iron Hand is an abuse of civil liberties, patriotic Jason makes it his mission to stop the program in any way he can. 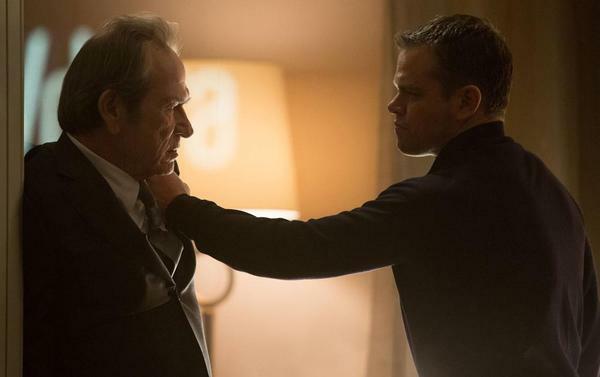 Though some might argue Bourne was more of a tertiary character with only 45 lines of dialogue in comparison to Dewey, Lee and Khalloor, Matt Damon returning as the titular hero is one of the more welcomed roles this summer. His speech may be sparse, but don’t let that confuse you with quality or intensity. Damon as always is very expressive through his body language and eyes, conveying emotion most eloquently, like frustration and anguish. 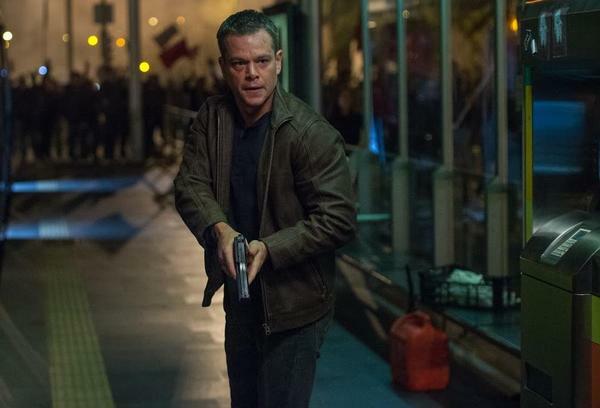 Jason Bourne is not an easy-going character or one you can relate to at all. He is dark, tormented and has no sense of humor, but yet Damon shines most entertainingly for a fourth time playing the unforgettable assassin that you cannot help but be charmed by as he fights to do the right thing. There’s no denying that the Bourne franchise has truly shaped Damon into a mega action star and grown into what the role means to moviegoers. Alicia Vikander new to the franchise is wonderful and a breath of fresh air, even with that ending denoting what a possible sequel might look like between her character and Bourne’s. 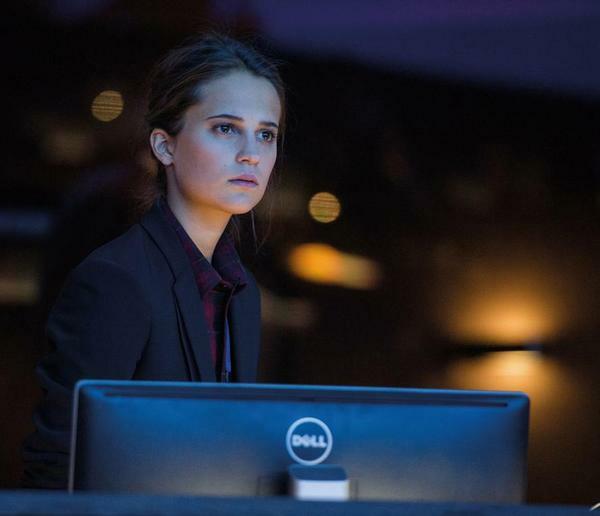 As the ambitious and young cyber ops director, Vikander played the role with incredible vigor and empowerment. As a rising star in the CIA with idealistic dreams, she contrasts glaringly with the old-school principles of the legendary and soft-spoken, Tommy Lee Jones, who plays every role at his absolute, devilish best, and wears that stony, rugged nature like a well-tailored suit. If Vikander is the “It Girl” of 2016, then Riz Ahmed as the portrayal of a Zuckerberg-type is the “It Boy” soon to be in every movie. Currently starring in HBO’s The Night Of and soon to be seen in Star Wars: Rogue One, Ahmed’s depiction of a tech giant contributing to an evolving world of digital security is the perfect blend of self-righteousness and apprehension — a rendering quite opposite of his introverted role on the HBO series. Vincent Cassel is The Asset and he is incredibly uncomplicated. He goes in, gets his work done and that’s his only objective. We don’t get time to know him but that’s the point. Playing to the key of past characters like Clive Owen, Karl Urban and Edgar Ramirez, Cassel portrays the ruthless assassin with a strong potency that instills fear in moviegoers. In addition to co-writing the script with Christopher Rouse, Paul Greengrass is a fun director who uses an interesting technique to optimize the movie experience with a very hard, docudrama sort of grit. While it felt at times there was too much grit as portrayed by the signature shaky camera allowing audiences to feel what it’s like to be punched through directional camera jerks, it seems the motorcycle chase in Athens had Greengrass utilize too much of that movie-going method. That said, throughout the movie, such an effect creates an incredible outcome for understanding action and creating intrigue as audiences feel vulnerable while moving every step of the way with Bourne. Such an upshot of directing produces a realism that only Greengrass does so well. Did we mention how amazing this soundtrack is? The music, composed by Academy Award-nominated composer, John Powell, starts from beginning to end, making the film feel like one continuous action sequence. Additionally, Moby’s signature track, “Extreme Ways” heard in all the Bourne films, returns with a remix that plays during the end credits — and as always, is bound to raise a few hairs on your arm. Jason Bourne is an action-packed, summer blockbuster that deserves to be seen. With high-speed chases and fearsome fight sequences, the visceral spectacle charged with conflict and excitement, anchors nostalgia from the original three films that first enamored audiences nearly 15 years ago. In keeping with the allure of each film’s ending that begs for a sequel while tying up loose ends, Jason Bourne clearly points to another episode where our loyal hero might find a new path to tread. Jason Bourne is now in theatres. To keep up with the film and its future production updates, follow them on Twitter and Facebook.